What Do Mormons Believe? » More Than the Bible? Q. How do you explain Revelation 22:18-29 (KJV) in conjunction with the addition of the Book of Mormon (and others) to Holy Scripture? I can handle verses 18-21, but 22-29 are beyond me. I’d love to hear what you think of those. The implication is that since these verses close out the Bible as we know it today, God will not allow any more prophecies. My response to this would be a long series of quotations from a talk given recently by the Apostle, Elder Jeffrey R. Holland, but I think it would be more sensible for you to read it or listen to it or watch it (below) yourself. Not only that, but it is pretty obvious that the Bible didn’t even exist until hundreds of years after those words were written. Therefore, anything that came after the revelation on the island of Patmos was received would be null and void. That comprises a good part of the New Testament, from what I understand. Then do you think these plagues or curses would be in effect if someone added or took away from the one specific book of Revelation? Yes, absolutely. And I don’t think we’re talking about casual translation ambiguities (two languages never can convey the exact same nuances and meanings). John was referring to those who would purposefully remove pieces of his vision, or who would sneak in novel ideas all without any authority from God to do it. In the Book of Mormon, a prophet named Nephi sees many of the same things in a vision that John saw and wrote about in Revelation, but he was expressly forbidden from writing them down. Then, Nephi narrates, “And I, Nephi, heard and bear record, that the name of the apostle of the Lamb was John, according to the word of the angel. And behold, I, Nephi, am forbidden that I should write the remainder of the things which I saw and heard; wherefore the things which I have written sufficeth me; and I have written but a small part of the things which I saw” (1 Nephi 14:25-28). It’s a fascinating moment, because it’s almost as if John has claim to legal rights to the contents of this vision. He alone was ordained to write them. That is what I see Joseph Smith doing in the JST (Joseph Smith Translaton) in the official LDS Bible. I could be slightly off, but he had around 80 or so additions and removals from the book of Revelation. Patty, that is an excellent point. Something we need to think seriously about. From a non-Mormon perspective, one could view the Joseph Smith Translation of the Book of Revelation as an audacious and seriously offensive act committed against God and Joseph’s subsequent martyrdom as fulfillment of the ominous promise. From a Latter-day Saint’s perspective, however, we see that Joseph was the restoration prophet. We learn from Nephi that there were, in fact, alterations made to the Bible. The angel told him, “Wherefore, thou seest that after the book [the Bible] hath gone forth through the hands of the great and abominable church, that there are many plain and precious things taken away from the book, which is the book of the Lamb of God” (1 Nephi 13:28). Joseph was ordained with both priesthood authority (through the hands of resurrected Peter, James, and John – same John we’re talking about here), and with divine injunction through revelation to restore that which was altered from the ancient text. We believe he had the God-given authority and blessing to do it. Joseph’s death, while gruesome, also became powerful evidence of his prophet-hood. He sealed his testimony with his blood, which is to say he believed in his calling and the gold plates and angelic visitations because, faced with mobs, beatings, wrongful imprisonment, and death, he never wavered in his resolve or showed any signs of giving himself up as a fraud. This fact, coupled with a hundred others that we could mention, provides solid support for our rationale. Now, Patty, I can certainly understand you won’t just accept this explanation, and I expect you will still believe Joseph sinned in creating the JST, but I hope you can see that the argument is tractable on the other side. I am pleased that you came to our site to get an explanation from the horse’s mouth, so to speak. It will do you worlds of good in getting understanding and knowledge over those people who refuse to hear our side. I had an amazing, life altering, indescribable conversion to a new life in Christ than I ever imagined was even possible. I don’t comment like this often, but on occasion will share my testimony, challenge LDS members, and hopefully be able to share what the Lord has done for us through the gospel of grace and in my life personally. As a former Mormon, I was extremely resistant to anything contrary to Mormonism, so I find it a big challenge to share with Mormons. I run into walls, and sometimes hostility and sometimes ridicule. I just can’t help it! I have new eyes and strongly desire for any of the LDS to have what I now have in Christ. God’s word to us as revealed in the Bible has become alive to me now. It is my guide, a lamp to my feet. I have the utmost respect and reverence for it (which is why I read this post). Whew, with that long intro, back to the topic. I suppose it would be good to know then if Joseph were really a true prophet. The implications are huge; not only for him, but you. You mentioned his death as evidence of his prophet hood. I encourage you to read, and perhaps you have, a non-biased third party account of his death. It was a real eye-opener for me. Back to topic. You seem very bright and I’m sure could think of some fantastic reasons or evidence of Joseph’s prophet-hood. The only problem with that is God’s thoughts are higher than ours and we should not lean on our own understanding. We have to line up our thoughts with God’s; we don’t see if we trust God’s word because it aligns w/ our feelings. We should never assume He would think a certain way just because we do. God’s word IS truth and we adjust ourselves to IT. Jesus and some apostles warned of false teachers and prophets. It would be nice if God had told us how to know…and, once again He shows His loving kindness by preserving His word so we can know for certain. While there are many Scripture, I’ll concentrate on Deuteronomy 13 and 18. This is where we find these instructions. Notice, false prophets can show great signs and wonders. They can perform miracles. False prophets can give accurate prophecies. In the New Testament, we learn they will appear good and deceive many. Still though, this does not prove a true prophet. The way we know if they are false is 1.) They introduce a different God and 2.) Something they declare in the name of the Lord does not come to pass. We know God has eternally been God and before Him there was no God and after Him there will be no Gods (Isaiah 43:10 + over 20 other verses). Joseph taught that God was a man who learned to be God and we have got to learn how to be gods also. Therefore, Joseph introduced a God who is different than the one true living God. I can think of 3 examples off the top of my head in D&C where Joseph spoke in the name of the Lord and those things did not happen. I could get long winded here, so if you want me to back up my claims specifically, I will. I too used to believe what my leaders told me about the Bible. We used to play the telephone game to demonstrate how unreliable the Bible was in my youth. That all changed with my conversion, new eyes and research. Honestly, I am so happy for you that you are happy in your spiritual life. You aren’t going to find a lot of hostility here, especially if you aren’t being hostile yourself (thank you for not being hostile). I’m just curious to know who, exactly, was a third party unbiased witness to Joseph’s death? The mob or the people in the jail with him? There weren’t a lot of unattached people just hanging around there. Anyway, thanks for commenting and good luck in your walk with Christ. I agree, in the day of Joseph, not too many people were neutral toward him. What I meant by a third party account was from today’s authors. Historians who have done their research for history’s sake. I always thought he was jailed on false charges, but never thought to ask what the charges were and was never told. The charges were that he ordered the destruction of the Nauvoo Expositor, a newspaper whose first and only edition claimed Smith was practicing polygamy (which he tried to hide) and that he intended to set himself up as a theocratic king. Given the tumultuous political climate in the fairly new country of the U.S., this was a highly sensitive issue. I also thought he died a martyr. I never realized Cyrus Wheelock had given Joseph a small pistol earlier the day he died. After the mob attacked, Joseph fired all six rounds into the mob; 3 misfired and 3 injured three of the attackers. I’m not even making a judgment here toward Joseph and his self defense. It’s just that the whole heroic martyrdom story I was told in my youth was not what it turned out to be. That is not the main point however. The bulk of the first comment is to demonstrate that God has given us a His word on how to know false prophets. 1.They introduce a different god and 2. they make a prophecy in the name of the Lord and it doesn’t come to pass. This is what happened with Joseph. Listen, I know how the LDS revere Joseph and I know you will probably take it personally; I know I would have. I would not even bother if it weren’t so important. Just notice in my reply, I did not belittle anyone and tried to be unemotional and only state what I know. I would hope you would trust and have faith in what God has told us on this topic. Put your weight in His word, let Him be your foundation, not a feeling you had. Test the spirits; if you had a spiritual manifestation that was contrary to what God has already told us (Joseph being a true prophet), it was not from the Holy Ghost because He would never contradict the Father; and the Father gave a very simple 2 part test in Deuteronomy 13 and 18 that Joseph failed. Thanks for explaining those historical issues. I actually had already heard about them all. But they were a little jarring the first time I realized those things too. We definitely get a more sanitized version in the manuals and in Sunday School. But I found out (as you did) a lot of the information right on the LDS website, and in Institute, which makes me think they aren’t trying to hide it. Anyway, I appreciate how it could shake someone’s testimony. I’ve heard that Rough Stone Rolling is a great resource, historically, for understanding the context of Joseph Smith’s life. It is actually one of my New Years Resolutions to read it. I’ve been able to reconcile those things with the gospel and the spirit that I feel in Church and it doesn’t bother me, but we’re all on our own paths back to God. They don’t have to follow the same course, but hopefully they will have the same destination. Are you suggesting there are many paths that lead to God? Patty, I meant to make a reply earlier, but just haven’t had the time. Jan pretty much took the words out of my mouth. The main thing that holds me to my belief in Joseph’s calling is the Book of Mormon. As an ancient record, it is far from discredited. In fact, its bona fides are more secure now than when it was first published; with the discovery a few years ago of an altar inscribed with the name NHM in Yemen, it can no longer be claimed there exists no archaeological evidence for the book. Secular scholars have yet to make heads or tails of the witnesses to the plates. Primarily, the point of the book is to bring souls to Christ. Reading it has brought me to Him in much the same way you said you received “new eyes.” The Book of Mormon is Good. An evil man could not have created it, and a good man would not have dared, unless he was directed by God. It isn’t only about Joseph Smith as a mouthpiece for God, though. That is a crucial starting point, but it also serves as a jumping-off point for another set of questions: how does Father speak to us? Who are His prophets? Does He answer prayers? Can I know what is true? How do I find out? Thankfully, my experience in Mormonism has given me a secure foundation for the answers to these questions. I have confidence in my actions because I know that the Lord is gracious and will answer my prayers. I can have confidence in these answered prayers especially when they are supplemented with the answers I find in the scriptures (deceased prophets) and in the teachings of the living prophets. I absolutely believe that there are as many paths to God as there are people on the world. No one lives the same life with the same experiences–everything is tailored to us for our good by our Kind Father in Heaven. However, I DO know that all of the paths that are going to Eternal Life eventually go through the temple. Which also means that at some point, everyone who is going to “heaven” (though you know that is a very vague term in LDS theology–I mean Celestial Kingdom in this case) gets there through the ordinances officiated through the Priesthood of God. Maybe you’ll have an amazing experience in this new church but 20 years from now you’ll feel that something is missing and you’ll find it back in the LDS Church. But you would have never accepted it fully and appreciated its significance without your time in the other church. I’m sure God is leading your path just as He’s leading mine. I also believe that if you continue to be open to His direction, He WILL lead you back to the LDS Church. That is what I mean by all of our paths lead are different but lead to God. Lest anyone take this comment the wrong way, I feel to jump in here and point out that the way back to God is through Christ and Mormons believe this is the only way. Don’t misconstrue what Jan has said here as she talks about paths as being different experiences for every individual. Absolutely right, thanks Willie! The only way to God is through Jesus Christ. Even with the required ordinances, without faith in Christ, repentance and charity, Christ will not claim us as His own and we will not return to God without Christ’s advocacy. Sorry that didn’t come up in my philosophical ramblings earlier. Jan, thank you for your compassion in hoping I will come back. I honestly highly respect you for this! One common misconception is that other churches feel they are the only true church like the LDS feel. This is not so. The majority of other Christian churches recognize that people in other Christian churches can know God and have salvation as well. The church is the body of Christ and is one. He either “knows” you or He doesn’t. I now follow and know the one true God, the church I attend just happens to be a good local group of other believers; but my attendance there has nothing to do w/ making it to the highest heaven. Thank you for your patience in allowing me a voice. I desire that you understand I come from a position of gentleness and patience. Please hear me out. 2. Who are His prophets? Luke 16:16 “The law and the prophets were until John: since that time the kingdom of God is preached, and every man presseth into it.” also Matt 11:13. 3. Does He answer prayers? Yes. and He continues to guide us. (Psalm 119:105) But we now have access to God through Jesus. When Jesus died, the veil in the temple was literally torn from top to bottom as an indication that our access to God is now by our mediator and high priest – Jesus; not a man who held the office of high priest who offered sacrifices annually. The OT was a foreshadow of things to come and all pointed to Jesus. It was Him who offered the final sacrifice and fulfilled the office of priest; it is He who is our high priest. (Book of Hebrews). The Christian life is a real, living, relationship with with the one true God through His Son. We are given several examples of how people come to know the truth. First, the question is asked, how can they call on Him in whom they have not heard? The answer: Faith cometh by hearing, and hearing by the word of God. (Romans 10:14-17). Also, when Paul and Silas went to Berea and preached the gospel to a group of people who did not know them, do we see them kneeling in prayer to receive a testimony? No, we see them searching the Scriptures to see if the things they preached we true. They are praised for this. (Acts 17:10-12). If God’s ways are higher than ours and His thoughts higher than ours, we need to conform our beliefs to His, not the other way around. I desire that you can one day say, “my experience in [Christ] has given me a secure foundation for the answers to these questions. I have confidence in [the Lord’s] actions because I know that the Lord is gracious and will answer my prayers. I can have confidence in [the word of God and that the true answers to my prayers will line up perfectly with His word. I can have this confidence because He will not contradict Himself.] These answered prayers are [verified] with the [truth] I find in the scriptures. Patty, I’m very appreciative of your kind tone. Thank you for keeping our discussion civil. There was a lot in your latest comment that I would like to respond to, but for brevity and focus’ sake I’ll just caution you not to oversimplify either Mormonism or Christianity. when Paul and Silas went to Berea and preached the gospel to a group of people who did not know them, do we see them kneeling in prayer to receive a testimony? No, we see them searching the Scriptures to see if the things they preached we true. They are praised for this. (Acts 17:10-12). You hold this up as the standard for knowing truth as if Mormons don’t believe in searching scriptures for answers and as if Christians don’t believe in direct answers to prayers. I think you are misrepresenting both sides. I have found the most success receiving direction through the Holy Ghost when I employ both scripture study (2 Timothy 3:15-16) and personal, devoted prayer (Matthew 21:22). Fasting also helps me connect to the Spirit. I do trust the Bible, and I do read it. Studying God’s words in scripture helps me recognize them when they come to me personally. But, here is how we do NOT find truth. It is not a feeling in our heart. Here is another misrepresentation. You presume that what Mormons call the influence of the Holy Spirit is merely a feeling and that Mormons rest their entire belief system on a groundless emotional experience. The influence of the Spirit is usually accompanied by a recognizable emotional response (Luke 24:32), and it also comes with some amount of intelligence or new understanding (John 14:26). He communicates to our hearts and minds. He also expects us to study previous revelations given through authoritative priesthood channels for the purpose of checking our human tendency to manufacture and believe our own thoughts as revelations, which is what Jeremiah warned us against. Believe it or not, we do think about whether we’re being deceived. We make it a priority to learn as much as we can through all available means including prayer and scripture study. We are just as aware of Paul’s warning as you are. I would caution you from using it as a weapon, because it’s very easy to turn the tables: from our perspective this scripture pertains to much of the Christian church, at least insofar as they are deceived into piously dismissing the Book of Mormon and any other possibility of new revelation. The devil can quote scripture, too (Matthew 4:6), which means even the pure WORD (as in “THY WORD IS TRUTH”) can be ‘wrested’ (1 Peter 3:16) or misappropriated. A Bible verse is only as good as its interpretation and application. These were a few of the assumptions I saw in your argument that you should examine more closely. I hope you won’t take them personally; I just hope you’ll make the extra effort to talk about our actual beliefs and practices instead of these hyperboles. Well said. I understand where you are coming from. I appreciate the points you brought up about the role of the Holy Spirit and how He confirms truth – heart and mind. I can see how my comments might seem black and white – (Mormon’s don’t study scripture and Christians don’t rely on prayer). Which is not the point I was trying to make -my bad. Let me try to explain better this time. The point I was trying to make is that when presented with a doctrine or truth found in God’s reliable, unchanging word that He promised He would keep (the Bible) – what a person’s correct response should be; especially when that truth is in conflict w/ a current belief system. The correct response is to change our minds to conform to God’s word. I’m not even implying that all Christians do this – they should- but don’t. Are there disagreements about doctrine? Sure. But not the core. The main things are the plain things and the plain things are the main things. And yes, like you said, the Holy Spirit does confirm truth (heart and mind). The challenge in Mormonism is that when presented with doctrine/truth from God’s word that is in conflict (and often mutually exclusive) with Mormon doctrine, the LDS member dismisses the word of God and chooses Mormonism’s doctrine because they have relied on the burning in their bosom. I always know when the Mormon can’t come to terms with the truth in God’s word because they begin to bear their testimony (which I am not mocking and I understand is precious to them). When I was LDS I would think, “like a complicated Calculus problem, I just can’t understand the apparent conflict. Let me put this issue on the shelf. I know the Church is true because I had that burning in my bosom when I prayed about the BOM. Therefore, whatever is presented to me that doesn’t fit in w/ Mormon doctrine must have some answer I just don’t understand yet.” I find this approach is common in LDS members and more often admitted by the female population. Even from your point of view, the Mormon would still have this problem w/ the BOM as some modern prophets contradict some doctrine from it as well, especially when compared to the original before all the changes were made (not all grammatical – some significant). If that confirmation is from the Holy Ghost (whom I call Holy Spirit), then it has to line up w/ and not conflict w/ God’s holy word. In 1 John 4:1 we are told to test the spirits. How do we test them? Does it agree w/ God? If you get confirmation that is contrary to God, it is NOT the Holy Spirit who gave you that confirmation (heart and mind). However, if you get that confirmation and it lines up w/ God’s word, then it’s a good confirmation. I mean really, does an engaged couple who prays and feels that the Holy Spirit revealed to them it is okay to live together first really think that came from God? The answer is obvious! You take your spiritual confirmations you get in prayer and see if lines up w/ God. The whole Jeremiah 17:9 and Provers scriptures as it applies to Mormonism comes into play when you are faced with believing God’s word, or the burning in your bosom when amidst conflict. It is not discounting the valid confirmations from the Holy Spirit. It doesn’t have to be complicated – more childlike actually. One way to dismiss the plain truths in the Bible are to say – oh that’s just your interpretation. I say that words have meaning and we are really communicating. Plus, Scripture is not open to private interpretation. (2 Peter 1:20) Thus hermeneutics; what did the author intend? How did the original audience understand it? and so forth. How does this play out practically? Just as our whole conversation began. God gives us a test to determine a false prophet. A plain, simple test. They introduce a different God. They predict something in the name of God that did not come to pass. Joseph fits that description (and some false predictions in the name of the Lord are canonized in D&C). The LDS is then presented with a dilema. Do I really trust what God’s word says, or do I go w/ the burning in my bosom. He even warns that false prophets can perform many signs and wonders. The signs and wonders do not prove one true. False prophets will appear good and thus deceive many. Do you go w/ God’s word, or your spiritual confirmation? Test it! What spirit gave you that confirmation? Does it agree w/ God? You mentioned talking about actual beliefs, not hyperbole. Here are a few core Biblical beliefs that are in conflict w/ Mormonism: God, Jesus, Bible, Man, and Salvation. Mormon doctrine is in opposition to what the Bible says on all those things. More specifically: here is God speaking to us through Isaiah with great passion. This is His testimony to us: (Isaiah 43:10) “Ye are my witnesses, saith the LORD, and my servant whom I have chosen: that ye may know and believe me, and understand that I am he: before me there was no God formed, neither shall there be after me.” If I were to try and coin a phrase that would be opposite that, I couldn’t have said better than Lorenzo Snow, “as man is God once was, as God is man may become.” We also know according to Isaiah that God did not have a father, He alone is God; also we will not become a god. It was Joseph who said we have got to learn to become gods ourselves. If following the Mormon gospel has the potential to get you to the highest heaven, then my pursuing this conversation would be foolish and rude. Given my knowledge though, how could I not reach out to the people I came from w/ the good news? “Patty, you knew and never told me?” is something I don’t want to be guilty of. My intent is not to mock or degrade. I am not pointing the finger of scorn. It’s an invitation really. I have no power to change your mind. The word of God though is powerful and the Spirit convicts. Having said that, I’m curious what you think I believe the real gospel is. So we are in agreement that it takes both scripture study and personal prayer to receive guidance from the Lord. You are concerned that Mormons lean too much on spiritual guidance and not enough on scripture, particularly the Bible. Is that correct? You have another concern that Mormons muddle their scriptural reading by including prophetic and apostolic writings beyond the Bible. Is that right? I assume that even if some mentioned lost biblical books were discovered (The Book of Shemaiah the prophet, and of Iddo the Seer, The Book of Gad the Seer, the other epistles to the Corinthians, etc.) you would not treat them with the same reverence you give those in the current version of the Bible, since the Lord didn’t “keep” them. Do I assume correctly? I have three questions. I’d like to know where in the Bible you learn that its words are inerrant. Where do you read that the record is closed (incapable of being supplemented)? When and why did God stop calling prophets (mortals who serve as his mouthpiece on earth, including apostles)? I get so frustrated with myself – I wish I could write more concisely and clearly. So sorry for the length. I hope you are even reading all my comments. Yes, we agree – both prayer and Scripture for guidance. (But do you really need to pray for guidance when God has clearly spoken though? – Do we really need to pray if we can lie about our taxes, go into more debt for that boat we really want (coveting), live immorally w/ our fiancé, or want to follow someone who has given false prophecy in His name?) I think it honors God when we revere Him and take Him at His word by trusting It. Don’t think I am downplaying prayer; my prayer life as a Christian is more alive, vibrant, effective and overall awesome than it ever was. Finding truth is not a matter of choosing which one is right (prayer or scripture). Since God is not a liar, answers to prayer that come from His Holy Spirit have to go together/line up WITH His word. No, that is not what I was saying. Not “leaning” but “choosing.” We are told to test or try things like spirits, prophets and teachers (even my leaders and yours) because some will be false. However, not so w/ God’s word – it is given as the standard of truth. It is the spirits we prove or test, not God’s word. In fact, that is how we test the spirits (or teachers or prophets) we compare them to God’s word. His word is a hammer, a rock, more powerful than a sword, a lamp to our feet, true, and is used for doctrine, for reproof, for correction, and for instruction in righteousness. Therefore, we test the spirit (burning in bosom) w/ His word, not the other way around. God was so brilliant to set it up like this or we could go about “choosing” whatever tickled our fancy. There has to be a standard. Did you catch my question I asked you? Maybe you are you politely ignoring it or would rather steer the conversation. I will attempt to answer all 3 questions you asked me. I am going to ponder it more and dig in next post. *On a personal note, so you know where I am coming from: I didn’t leave Mormonism for some egregious sin or offense. I loved the church, I loved being a Mormon. I still love the Mormon people. I wanted it to be true. I still held on to Mormonism for a long time despite discovering some HARD evidences against it. It took an act of God to bring me to my knees in humility and submission to Him. Hard, hard circumstances. Then, I finally experienced His washing and regeneration, and infinite love. In that turning to Him no matter what, in brokenness and submission, I experienced new birth (I didn’t even know that term at the time until I found it in the Bible later – but I knew what it was after I experienced it). It was terrifying to think of abandoning Mormonism! But God doesn’t give a spirit of fear, but power, love and a sound mind. Don’t think I one day walked away because I wanted to or couldn’t live the Mormon way. It was with THE most fervent and soul-searching prayer, fasting, and study. The difference now is that it all lines up w/ God’s already revealed truth. God guided me into a personal relationship w/ Him that is not dependent on any specific church. As I grew closer to Him, it was He who led me out by showing me more truth about Mormonism, the truth in His word, answers in prayer, and ongoing personal experiences. The thing that changed most is my intense love for Him, like never, ever before in a way I never imagined was possible. No way I ever could have convinced myself of what I know now, let alone you. I only challenge you to re-examine a few things in the light of God’s already revealed word. Then trust Him – (like a child)! It is w/ pleading and a sincere desire that I comment. I hope you can see that it is love that drives me. I’m curious what you think I believe the real gospel is. I wasn’t trying to sidestep this question; your previous comment just brought up some questions of my own. I really would like to understand where you are coming from. I assume that your conception of the gospel (“good news”) is much the same as my own: that God sent His Son to suffer for the sins of mankind, and to die for mankind and that all people have a chance to receive salvation by accepting this sacrifice. This is done by putting our faith in Him and His teachings. do you really need to pray for guidance when God has clearly spoken though? I certainly agree with you that most people don’t require God’s additional spiritual direction to keep them from murder or adultery, but not every personal dilemma is black and white. What does the Bible specifically say about voting for Ron Paul? How much is too much to spend on a house? Who among my friends is in need and what can I do for them? The Bible provides some good guidelines and principles to questions like these, but they are not decisions the prophets have “clearly spoken” about. This is the arena I find the Holy Spirit’s guidance to be indispensable because His answers are personal and tailored to the circumstances I’m in. I love your explanation on the gray areas – like voting for Ron Paul (big smile on my face). Well said, true! However, that doesn’t solve the problem of His already given, clear direction (false prophet example above) that comes in conflict w/ your personal belief system. Two different things. It seems like our conversation has branched out. some looming questions. 1. Do I agree w/ your statement of what the gospel is? 2. Where in the Bible I learn that its words are inerrant? 3. Where do you read that the record is closed (incapable of being supplemented)? 4. When and why did God stop calling prophets (mortals who serve as his mouthpiece on earth, including apostles)? I will give you what I got on question 2,3, and 4 here because the topic is the Bible after all. I’ll take question 1 over to the gospel post you linked to above. The books of the Bible, as they were originally written under the inspiration of the Holy Spirit , were 100% inerrant, accurate, authoritative, and true. It is assumed in the verses that God is true however. We also have apostles quoting New Testament verses and calling them Scripture. Jesus was always referring to Old Testament Scripture and He seemed to trust it. He would rebuke the religious teachers of the time by saying things like: have you not read? You are a teacher and you do not know?… Also when being tempted He said “It is written” all three times. Heavenly Father is so good to us by not only giving us His word via the Bible, but graciously provides other means to confirm the reliability of His word. This confirmation is external (geography, history, language, manuscript, dead sea scrolls, archeology, the Jewish race, outside same era historians, and more) and internal (fulfilled prophecy, eye witness testimony, and God’s very own promises with His excellent faithful and unchanging character as surety). Psalm 138:2 …for thou hast magnified thy word above all thy name. And John 17:17 …thy word is truth. 3. Where do you read that the record is closed (incapable of being supplemented)? Wow, a topic too long to cover entirely now! I have studied enough to satisfy me. However, by the questions you ask, I can tell you have already delved into this issue also and the answer I give, you have probably heard. Briefly, you know the whole Revelation scripture about not adding to God’s word. Technically, one could say it only applies to the specific book of Revelation, but in the spirit of the meaning of that scripture and other verses that convey a similar meaning, I think it does apply to books outside what we have in the Bible. Also, given the topic and location of the book of Revelation (the end), only adds to the validity of excluding other books. I can’t think of another specific verse off the top of my head about a closed canon besides the common ones we already know. It’s like this: I tell my kid, “you are in trouble, don’t leave your room.” 10 minutes later, they are out of their room. They say, “well I didn’t leave my room for an entire 9 minutes.” Technically, they didn’t break the rules, but that’s not the intent of the punishment. There is no reason to believe that God would give further revelation to add to His Word. The Bible begins with the very beginning of humanity—Genesis—and ends with the end of humanity as we know it—Revelation. Amos 3:7 says, “Surely the Lord GOD will do nothing, but he revealeth his secret unto his servants the prophets.” In fulfillment of this, we learn from Mark’s account that when Jesus tells some of His own about end times, He finishes by saying, “But take ye heed: behold, I have foretold you ALL things.” Basically, we got it all, beginning to end. Earlier you alluded to “missing” books of the Bible. This is another topic entirely: What makes a book Scripture? 4. When and why did God stop calling prophets (mortals who serve as his mouthpiece on earth, including apostles)? (*I got a lot of help on this topic and a good portion is cut and paste). Apostles: in a broad sense the Christian church has apostles or “one sent forth [to proclaim Christ].” In fact “missionary” is the Latin translation of the Greek word “apostle.” However, the apostles in Ephesians 4:11 is specifically talking about the 12 hand picked by Jesus himself. They had to be eye witnesses of Jesus’ ministry and resurrection (II Peter 1:16; 3:2, I John 1:1-4; Jude 17-18). It is these who laid the foundation which the building (body of Christ/church) is built. There are only “twelve apostles of the Lamb” and they are with Him now. Their names will be in the twelve foundations of the wall of the New Jerusalem (Rev. 21:14). I suppose if the apostles in Mormonism are equivalent to the foundational 12, there would have to be a whole lot more foundations in His city with all their names – but no, only 12. Plus, speaking of apostles, their calling and work were so unique that no man today could do what they did (e.g. be eyewitnesses of Christ’s entire earthly ministry – Acts 1:21-22; 10:39, 41-42; II Peter 1:15-18; I John 1:1-5; be personally called by Christ – Matt. 4:18-22; Mark 1:16- 20; Luke 6:13; John 1:43; Eph. 4:11; be taught the gospel by Christ during His earthly ministry – Matt. 20:17; Mark 4:34; Luke 6:20). LDS claim Eph. 2:20 and 4:11 shows the necessity of prophets and apostles today. The New Testament does speak of prophets in Acts 11:27-28, 13:1, 15:32, and 21:10. But, the word “prophet” refers to any proclaimer of God’s truth in the New Testament. In that sense the church today does have living prophets on the earth. But, in the sense of the Old Testament prophetic office like Isaiah or Jeremiah, Jesus declared, “The law and prophets were until John [the Baptist]: since that time the Kingdom of God is preached, and every man presseth into it” (Luke 16:16; see also Matt. 11:13). The Bible also says, “God who at sundry times and in divers manners spake in time past unto the fathers by the prophets, hath in these last days spoken unto us by His Son” (Heb. 1:1-2). Patty, thank you for your words. I am sorry I have not had time until now to sit and make a response. 2. Where does the Bible say it is inerrant? I appreciate all you said about God’s word being trustworthy as it was “God-breathed” to His prophets. I believe that, too. The scriptures you cite from 2 Timothy and 2 Peter are wonderful. My question is more about the trustworthiness of the very human process of transmission of scripture from the author to my modern Bible. The scriptures you cited that deal most directly with this, (“Heaven and earth shall pass away, but my words shall not pass away.”) are not clearly referring to a book or a set of books. I can see how you might make that interpretation, but I don’t see the inerrantist argument being motivated by those scriptures. See this short article to see where I’m coming from. I was surprised when you quoted Amos 3:7. This is the scripture Mormons point to in defending our need for a modern prophet. Your points on this topic weren’t terribly convincing to me. If I were protestant, the reason I would believe in a closed canon wouldn’t be because of the scriptures in Revelation (prophets preaching after Deuteronomy 4 –including Jesus– didn’t seem to have a problem adding to the Bible), but simply because nothing had been added to the Bible. After so many centuries of heaven’s silence I might resign myself to the same conclusion. Do you have similar feelings? Even as a Mormon, I have wondered why such an extended prophet-less era happened, but I am thrilled to know that God speaks to us through prophets once again. When did the calling of prophets cease? John the Baptist was the last prophet. The formal calling of prophet ceased with Jesus’ ministry. Apostles are not prophets. Apostles were a one-time calling for the original twelve (or 13, including both Matthias and Judas, or 15 including Paul and Barnabas). People called prophets in Acts are not really prophets (this proposition confuses me with the whole inerrancy assumption; besides, my main definition of prophet in this context is a mortal with authority from God to write scripture, and I believe you would include at least Paul, Peter, John, and James in that list; I should probably have been more explicit with my definition). Why did the calling of prophets cease? Because it was God’s will. The Bible doesn’t really say why. Is that about right? I would like to talk to you about your specific concerns about Joseph Smith being a false prophet, but I first wanted to look at the groundwork for whether you believe there can be any more prophets. If the Bible plainly told us there are to be no more prophets, then we could easily dismiss any supposed prophet as fraudulent. Unfortunately, the Bible doesn’t make that point clear, and Jesus even warns us against “false prophets” instead of “any prophets,” which I find interesting. Anyway, I’d like to hear your thoughts. 2. Bible inerrant. Read the link and see the problem. Definitions. We could get lost in a forest of word definitions and lose track of the whole point. Let’s talk about the real implications here. Trustworthiness. I think the Bible is trustworthy. You may or may not, I find a rainbow of Mormon thought on this: from – No, in fact how can we even trust one verse , to – it has some very profitable things. In your reaction to the Bible, you remind me of my son. For example, I tell him, “Don’t do that.” He continues to do that. He justifies it by saying I was not specific what “that” was. It bothers me that verse after verse speaks of how God views His word and how we should view His word. He holds it higher than His name – if it’s that important to Him I believe He is more than capable of preserving it and even directing the compilation of His words into one unit we call the Bible. How kind and loving of Him. It is so important to establish the trustworthiness of the Bible because of what it says; the nature of God, Jesus, nature of man, salvation, and so forth. Do we take God at His word? It is too convenient to run into something that doesn’t agree w/ your preset doctrine to justify it [like my son does]: Well sure, but can we trust the men? Or that must have been one of those mistakes in translation. Or was it really this set of books? Here is my child-like view. God said He would keep His word and by that same supernatural power He has. I’ll go w/ that. I think on this point we will have to agree to disagree. I’m going w/ the Bible. You of course are at liberty to look for ways around it. Reminds me when the serpent in the garden questioned and deceived Eve – did God really say that? I always find it curious that a group so adamant about being called Christian is also so creative in ways to discount the Bible. It is critical in Mormonism to treat the Bible like this for a good reason. Mormonism can’t stand if the Bible is inerrant/ or to the point, trustworthy. Speaking of trustworthy scripture…As a Mormon, I was absolutely crushed when I was given a gift of an old edition of the D&C. I can’t remember which edition it was. It so shook my testimony, I ended up throwing it out. Some things I vaguely remember: one whole revelation was removed, many, many changes- very significant in altering the original meaning too, some original writings talked about divining rods and other “magical” practices – all that language removed. I’ve been following your conversation for a while. I hope you don’t mind if I put my two cents in. Thaddeus- That article you referred to was very well written. I think that it’s more than just definitions, but it does get to the core of Patty’s question. The Bible is the word of God. No one is denying that. LDS folks study and love the Bible. You know that the Mormon church also has the Book of Mormon and living prophets today. They are also God’s word. They point us to Christ, the only one who can save us. Having a prophet today can also help us to further our understanding of the scriptures and help us to know exactly what God meant. This clarification is vital in the world today. People need God’s word more than ever, and there is also so much confusion. It’s easy to see the effects of different interpretations of the Bible; that’s why there are so many different churches out there, all preaching from the same Bible. Patty, from what you described (with the “divining rods” and such) that’s from the Book of Commandments. “The Saints have never believed in inerrant prophets or inerrant scripture. The editing and modification of the revelations was never a secret; it was well known to the Church of Joseph’s day, and it has been discussed repeatedly in modern Church publications, as well as extensive studies in Masters’ and PhD theses at BYU. Hi, and good to hear your input. Let me first talk about your quote from FAIR. I was your typical Mormon. I was active and dedicated. I never heard about the changes to D&C until someone showed me the forbidden anti literature. I was under the (clearly false) impression that Joseph got the revelation from God, it was written down, compiled and that’s how we got D&C. While the scholars who hold impressive degrees might have known about the changes in D&C, I find it hard to believe your average lay member has any idea. Many of the current lay members I have spoken w/ are even unsure if Joseph was a polygamist let alone the changes w/ D&C. Honestly, which common member in the LDS church has time to adequately review those extensively studied master’s and PhD thesis from BYU, let alone the basic BOM and Bible? Even if the church didn’t try to keep it a secret or not is irrelevant. I find it disingenuous to fault Christians on their reliance of the Bible, yet hold such low standards for the reliability of D&C given the radical changes it has undergone. Here is the concern I have w/ relying on FAIR for doctrine. They have no authority to receive revelation for the church. They say things in complete contrast to the modern day LDS prophets and apostles. If they could speak w/ any authority for the LDS church, then the whole “needing modern prophets” argument falls flat. Example: your quote above, “The Saints have never believed in inerrant prophets or inerrant scripture.” Really? That is not what I was taught. Compare FAIR w/ D&C 1:38 “whether by mine own voice or by the voice of my servants, it is the same.” or D&C 21:5 “For his [Smith’s] word ye shall receive, as if from mine own mouth, in all patience and faith.” President W. Woodruf, “I say to Israel, the Lord will never permit me or any other man who stands as president of the Church to lead you astray. It is not in the program. It is not in the mind of God.” There is more, but you get the point. It doesn’t have to be so complicated. God said if a prophet says something in His name and it doesn’t come to pass – not a prophet of God. Also, introducing a different God, (one who used to be a man), would qualify someone as a false prophet. Just trust what God says. God isn’t interested in fancy degrees to know Him, rather faith… trust Him like a child would his father. God said it so plainly… listen. There was a great article in the Ensign that you might have missed in 2009. Elder Jenson talks about the Book of Commandments and the early revelations of the church. Under the subheading “Preparing the Manuscript Revelation Books for Publication during Joseph Smith’s Time”, Elder Jenson describes the changes. They are not “radical changes” as you supposed, and as you read the Ensign article you’ll see why changes were made. Anyways, this is also a good Ensign article to help “lay members” like you and I to understand the PhD’s thesis papers. I haven’t seen a single thing that FAIR has stated that is in “complete contrast” to the prophets and apostles, or even remotely opposing their teachings. Please refer to the link above (again, sorry about the broken link earlier) and it will do a better job at describing what I was trying to say about inerrant prophets in my previous post. Sorry, I didn’t explain the context for the quote more thoroughly. We both do agree, that FAIR has no revelation for the church. (I quote them because they are able to articulate things better than I can.) And we both see the need for a modern day prophet to receive inspiration from God to direct his church. The question remains the same—was Joseph Smith a prophet? And as you know, the answer to this can be found without a masters or PhD degree. It’s found by praying to God and asking him. We know through the power of the Holy Ghost that he is a prophet of God, and in turn, that the Book of Mormon is true. These both point us, in conjunction with the Bible, to Christ, who is our Savior. I always find it curious that a group so adamant about being called Christian is also so creative in ways to discount the Bible. We are not looking for ways to discount the Bible. Mormonism stands up just fine with the Bible. (So do the millions of Christians who don’t believe the Bible is precisely inerrant.) I read and trust and love the Bible. I just don’t think we should make ourselves fools by declaring it to be more than it is and more than it claims to be. The Book of Revelation is valuable because it was written by someone with authority and revelation from God. John had the authority. His book contains doctrines and teachings that are profitable and sacred, but the book itself has no priesthood authority, and importantly, it can’t answer questions or clarify its meaning any further than it does. This was a theme in Christ’s own ministry. Lacking prophetic pronouncements (until John the Baptist began to upset their balance), the Pharisees relied on the Torah to explicate God’s view of everything from knot-tying to Sabbath-day healing. The Old Testament was their infallible, authoritative source. They knew it forwards and backwards in its original Hebrew and could recite it verbatim. Why then did the Pharisees, so intimate with the Holy Word, react negatively when the Word Himself came to them? Jesus cited scripture, but His teachings were not the same as theirs. He overturned long-standing religious laws (see Matthew 5). He introduced a God they thought blasphemous: one with a mortal Son. He had an additional source beyond the Torah: divine revelation. “He taught them as one having authority” (Matthew 7:29). (Most had that reaction), but not all. Yeah, not only did they “react negatively,” but they flat out rejected and killed Him. God was incredibly patient with His people, Israel, with warning after warning that they not turn from Him. After so much rebellion, and refusing the prophets, they suffered the consequences- as prophesied in Isaiah 6:9-10. They would hear and not understand, they would see and not perceive. Jesus explains the phenomenon of what you asked above in Matthew 13:14 that “…by hearing ye shall hear, and shall not understand; and seeing ye shall see, and shall not perceive.” Jesus said, this was a fulfillment to Isaiah’s prophecy. This same principle can apply today. If a person hears the good news about grace again and again; then continually refuses it through self-justification, manipulation of words, denial or flat our rejection; they will eventually have hard hearts and ears and eyes that do not understand or perceive. Then Thaddeus, why do you still follow Smith? Why, when God made it plain in His word how to spot a false prophet, do you continue to say Smith was true? Why do you put your thoughts above God’s in this matter? That doesn’t seem like trusting the Bible. I am not here to point the finger of blame or scorn. Rather it’s w/ boldness and pleading that I beg you turn to only Him. Put the full weight of your trust in Him and what He has already said and done. Everyone has a sin problem and His sacrifice was final and complete to pay for it. You don’t add to your redemption by your actions because what Jesus did was sufficient. You don’t earn your way to Him through ordinances or works. You just accept what Jesus has already done for you apart from your goodness because He died for us while we were yet sinners. As a reasonable response to gaining eternal life, you submit your life to Him and get to perform many good works; to His glory. There is eternal life, abundant life, clear sight/understanding, and all blessings in Him – apart from any specific church or organization; Him alone. I have been watching this conversation and it looks like it has finally reached the inevitable point of passioned disagreement. I was once instructed by a wise teacher of world religions that when two devote religious groups come together they have three choices: 1) Convert the other 2) Kill the other or 3) ignore the other. In America we are pretty good at #3 because we separate our religious lives from our working daily lives and are held together as a people by other cultural conventions. However when we get into a heartfelt conversation of our deepest differences it may begin as a scholarly congenial conversation, but as we dig deeper and push harder we just have to come to the conclusion that the other person is crazy….And start expressing it that way. 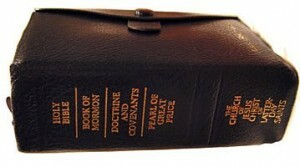 While it is the stated purpose of this site to express the belief system of the LDS church, it just isn’t that easy (as the long discussion has made evident) The basic belief of the LDS church regarding scripture is stated in the 8th Article of Faith: We believe the Book of Mormon to be word of God, we also believe the Bible to be the word of God as far as it is translated correctly. Patty can not believe the Book of Mormon because she doesn’t believe that Joseph Smith was a prophet. She also takes um-bridge with the “as far as it is translated correctly” clause. Thaddeus, on the other hand believes that Joseph was a prophet and that therefore the Book of Mormon is the word on God and also that while the Bible is the word of God its many translations have resulted in some mistakes or omissions. Might I suggest that neither of you will probably ever convince and convert the other; So I’m afraid you’ll either have to ignore the other or somebody’s going to get killed.